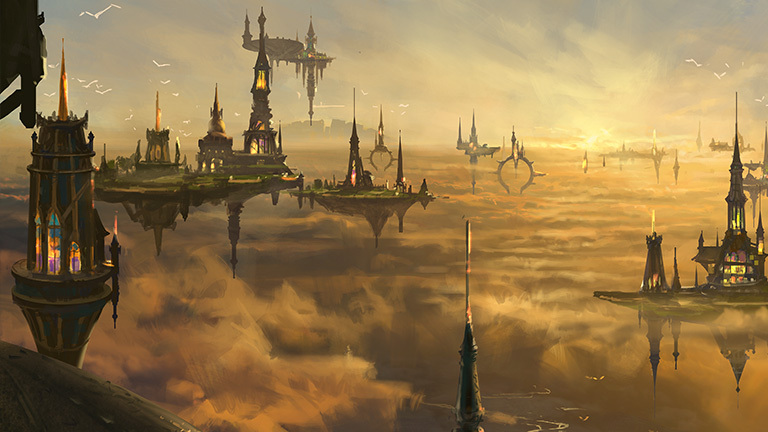 Towering, gold-encrusted monuments break the unending monotony of a horizon formed of sun-blasted sand. Awe-inspiring, animal-headed gods walk among the people, offering them care and protection from the horrors of the desert. A wide, life-giving river offers its abundant bounty, providing for every physical need. Happy, hopeful people offer sacrifices in grand temples dedicated to their benevolent gods, addressing their spiritual needs. They know that this life—wonderful as it is—is just the beginning, the prelude to the perfection that awaits them in the afterlife, promised to them by their God-Pharaoh. 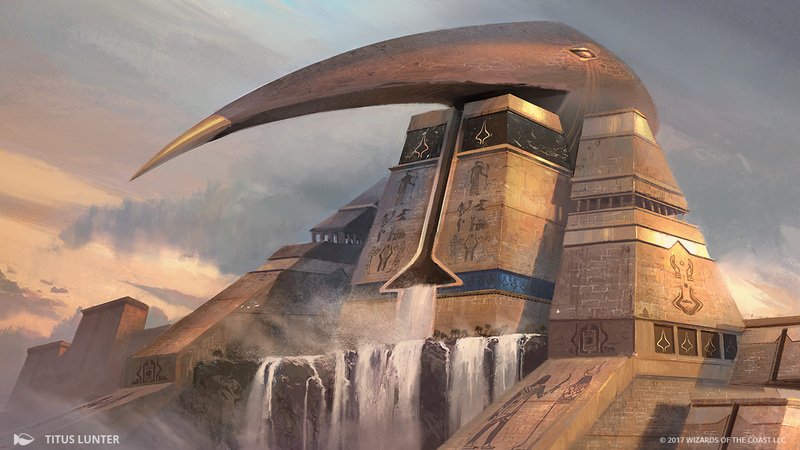 Amonkhet is a plane of dichotomy. Beyond the lush river valley lies endless, scorching desert. 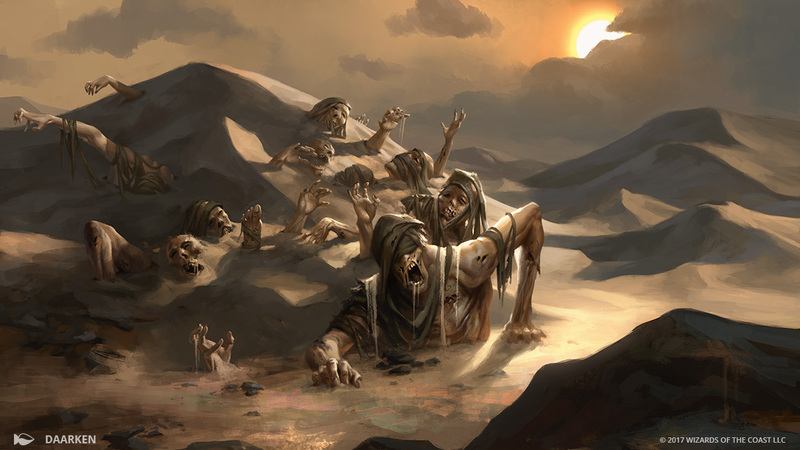 Accursed, desiccated mummies roam the desert, while carefully embalmed mummies attend to the needs of the living in the glorious city. The people have everything they need—they are protected from the desert heat and wandering mummies by a magical barrier, and they spend their lives in focused training, honing their bodies and minds to perfection. Yet they eagerly anticipate the time when they will be permitted to die in combat and leave this world behind. The gods are custodians of the path to the afterlife, established by the God-Pharaoh to purify and perfect the people who follow it and undergo its trials. Each god oversees one of the five trials and instructs the initiates who are preparing to face the trial, helping them to cultivate one of the five aspects of mortal perfection: solidarity, knowledge, strength, ambition, and zeal. 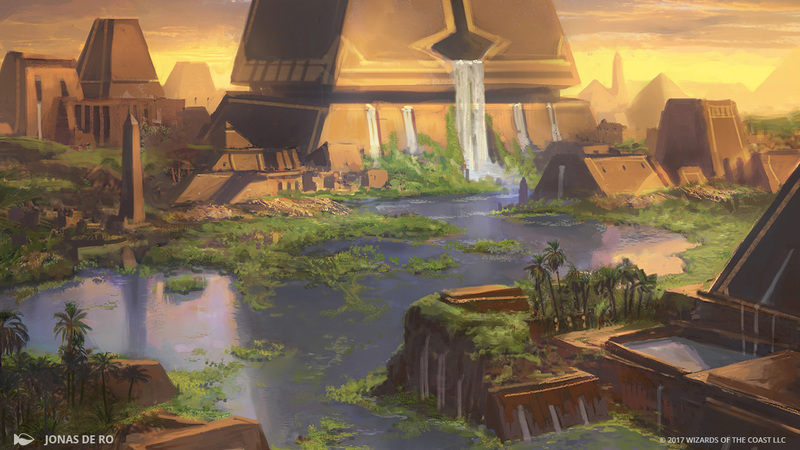 On the surface, Amonkhet seems like a marvelous place to live, but something unsettling and nefarious lurks behind the grand facade. 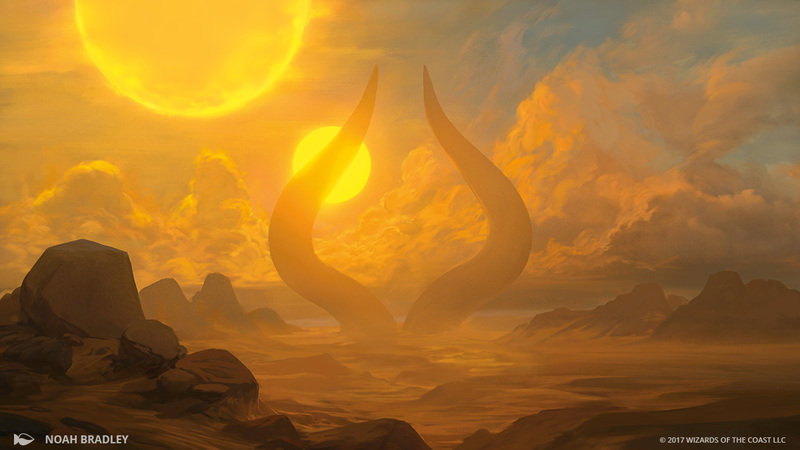 The wise and benevolent God-Pharaoh, said to be busy preparing the wondrous afterlife for the worthy, is actually Nicol Bolas, the malevolent dragon Planeswalker whose schemes reach far beyond this plane. The cat-headed god Oketra embodies stability, order, and protection. She values coordinated purpose and cooperative action. Her trial is the first one undergone by initiates, forcing them to rely on the other members of their crops and stand or fall together. With his ibis head and glorious wings, the god Kefnet represents intellect and the magic of the mind. Kefnet oversees the Trial of Knowledge, and judges worthiness based on mental prowess. He believes that knowledge is power and his greatest weapon is his mental acumen and magical ability. Crocodile-headed Bontu is the God of Ambition. Bontu teaches that no one is born strong—they become it. Pride and cunning are tools for self growth. She is closely associated with the process of embalming both the initiates who attain a Glorious Death and those who fall ingloriously along the way. Jackal-headed Hazoret is the god of zeal. Hazoret's ideal of zeal encompasses powerful emotions as well as religious intensity. It is not enough to merely want a place in the afterlife, initiates must channel that drive into a furious battle that will determine their final place in the afterlife. Rhonas is the cobra-headed god of strength, both in physical superiority—the ability to exert and withstand force—and mental aspects of willpower. The ability to resist fear, to face battle with indomitable will, and self-reliance are the qualities that ensure success in Rhonas's trial. Though he is technically a vizier of Oketra, Temmet's work brings him in contact with all five gods. He is only sixteen years old, but his dedication to Oketra, to solidarity, and to learning has elevated him to a position of supervising the other viziers in charge of the city's infrastructure. Hapatra is a human vizier who spends most of her time in Rhonas's monument. Her work with basilisks in the Trial of Strength has made her resistant to all kinds of venoms and toxins. She has an affable sense of humor, and uses her good nature and powerful poisons to constantly improve Rhonas' Trial. Neheb is a highly accomplished initiate who has earned four cartouches and thus a place in the House of Hazoret. He inspires both fear and respect in all who see him fight. He is a talented charioteer, and his favored weapon is a spear, which he wreathes in magical flame before battle. Samut is an initiate who doubted the legitimacy of the God-Pharaoh. Renowned for her speed and skill in hand-to-hand combat, Samut was a leader in her crop. Secretly, she studied the dance and martial arts of the past, and discovered that her people's history had been wiped from memory. Nicol Bolas's gods of destruction. Once benevolent protectors of Amonkhet, Nicol Bolas twisted them into their present forms. Their arrival, foretold in prophecies known as the Hours, promised paradise but delivered apocalyptic chaos. The Scorpion God is massive and soulless, but is initially greeted with joy by the immortals of Amonkhet. Their revelry is soon demolished as it reveals its purpose: to hunt down and kill each remaining god. Next, in the Hour of Promise, the Locust God begins to tear down the Hekma. The god's swarm of locusts fills the sky, blocking out the sun. With the barrier gone, the city is exposed to the threats of the desert. But that is not the end. The Hour of Eternity arrives with a final scarab-headed god marching into the city, leading ranks of lazotep-coated undead soldiers—the Eternals. 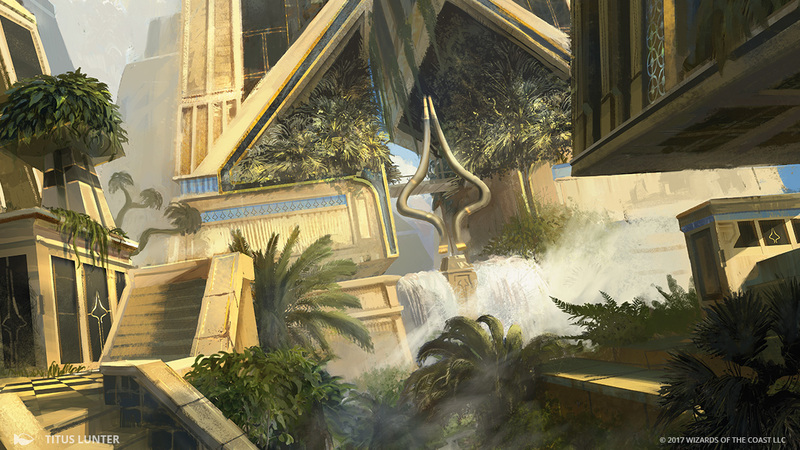 Naktamun is a sheltered city oasis in the midst of a desert of horrors. Monuments to the Gods, sparring rings, mazes formed of strange illusions, jungle-like ranges, and obstacle courses, along with ordinary classrooms, are the background for the comprehensive training regimen of the initiates. 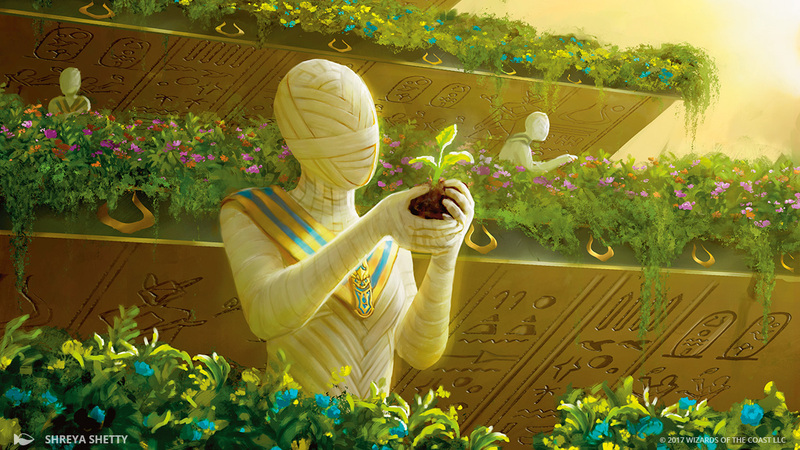 Of the five humanoid races of Amonkhet, humans are the most diverse and adaptable. Humans train in a wide variety of fighting styles, including those particularly favored by other races. Humans are willing to go to any length, exhausting all available options, to reach the pinnacle of achievement. Aven have humanlike bodies, arms, and legs, along with birdlike wings and heads resembling those of hawks or ibises. Aven delight in flying above their foes, using their superior mobility to confound and outpace their opponents. 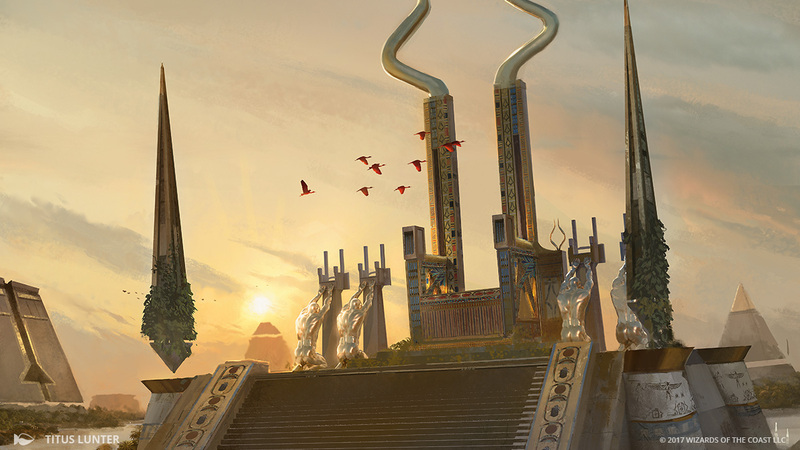 The khenra of Amonkhet are tall and lean, with graceful bodies and heads that strongly resemble jackals. 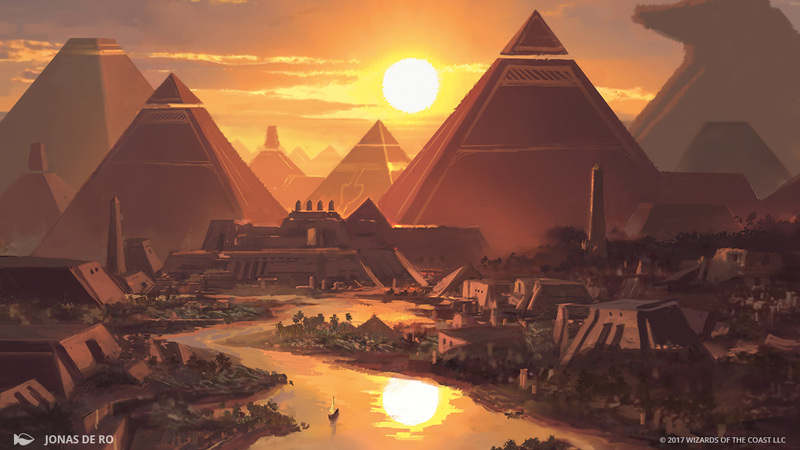 Nearly every khenra is born a fraternal or identical twin, and a pair of khenra twins forms an extremely close emotional bond unknown to most other residents of Amonkhet. Minotaurs are powerfully built, barrel-chested humanoids with heads resembling rams. As their appearance suggests, they combine great physical strength with stubbornness, bravado, and almost reckless bravery. They revel in combat, especially when the odds against them seem overwhelming. Naga look like enormous snakes with shoulders and arms protruding from humanoid torsos. Naga believe in a principle called the Sweetest Harmony, which describes a perfect balance between the body and the mind. Finding that balance, as they understand it, is a sure path to glory in the trials. A brilliant telepath with insatiable curiosity, Jace strives to know all there is to know. His skills in illusion, mind reading, and memory modification make him one of the most talented—and potentially dangerous—Planeswalkers in the Multiverse. Cunning and ambitious, Liliana is quietly growing more powerful by the day. And thanks to a contract with some demons, she's not growing any older. She wields the blackest of magic—necromancy—and is a master of animating the dead. Compassionate but short-tempered, Chandra ignites with rage—and often flames—whenever freedom is threatened. Her natural pyromantic gifts and her consuming passion make her a fire mage of unparalleled power.